This week our high school students and staff have been part participating in Endersession. For those of you not familiar with Endersession, it is a series of weeklong courses led by IACS staff which occur on and off campus. Our travel groups have gone to as far away as the Dominican Republic and New Orleans, while we’ve had other developing their creative skills on campus learning photography and movie making. It’s a great way to wrap up a year of hard work! 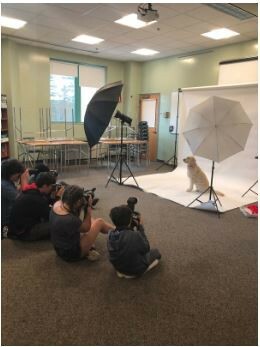 Students photograph and adorable subject! 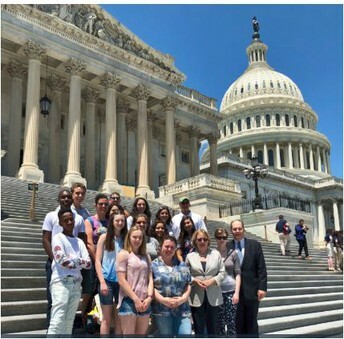 Students, Dr. Arnold, and parent Peter Torkildsen meet up with Rep. Niki Tsongas. A limited number of summer reading selections will be available for $10 ea at the end of year BBQ on Wed June 20th. Link to IACS library page with Summer reading list for both Middle School and High School. Prescription medications may be picked up by a parent/guardian anytime before 1pm on June 20th. Any medications that are not picked up by this date will be destroyed per policy. Epipens and inhalers will not be destroyed. Epipens and inhalers can be brought home by students or picked up by parent/guardians. Students are welcome to stop by the Health Office on June 20th to retrieve their inhaler or epipen. 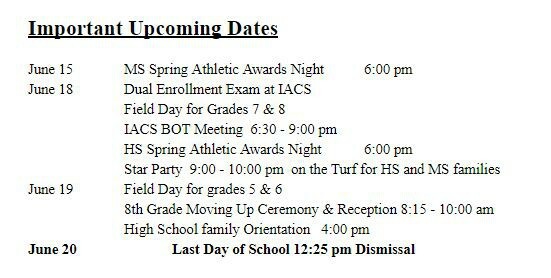 If you have any questions please call the Health Office at 978-649-0432, ext. 2104 or email Gayle Nutile-Pimm at gnutilepimm@innovationcharter.org. Thanks for another great school year!! By now all families should have received an email for the option to sign up for carpooling, and a letter mailed home with information about busing. 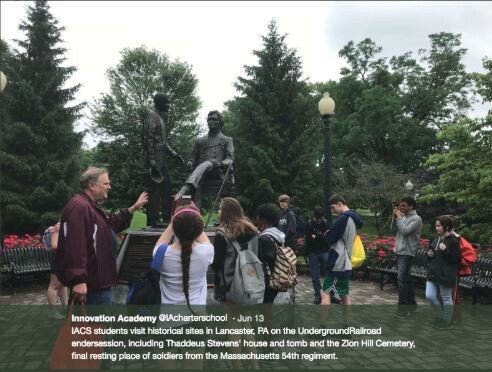 If you have not received this information please contact Marybeth Bush, mbush@innovationcharter.org or 978-649-0432 ext 3218. The out of town Christianson buses are filling up so if you are interested in using that transportation option do not delay in signing up. A special thanks to all of our Student Ambassadors who did an amazing job of showing prospective new students all the great qualities of our school. 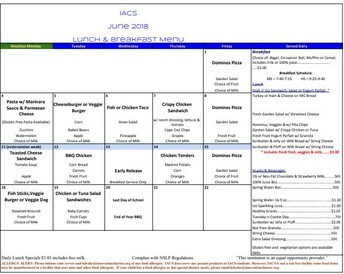 IACS School Nutrition Program: The June Breakfast and Lunch Menu is posted here. 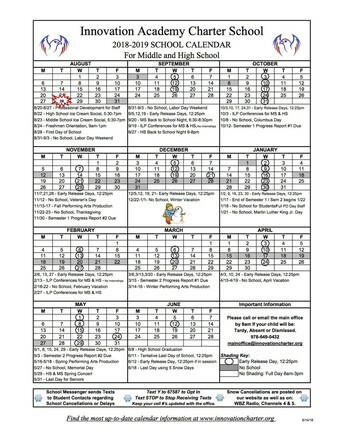 Contact Karen Drake kdrake@innovationcharter.org if have any questions about the School Nutrition Program. 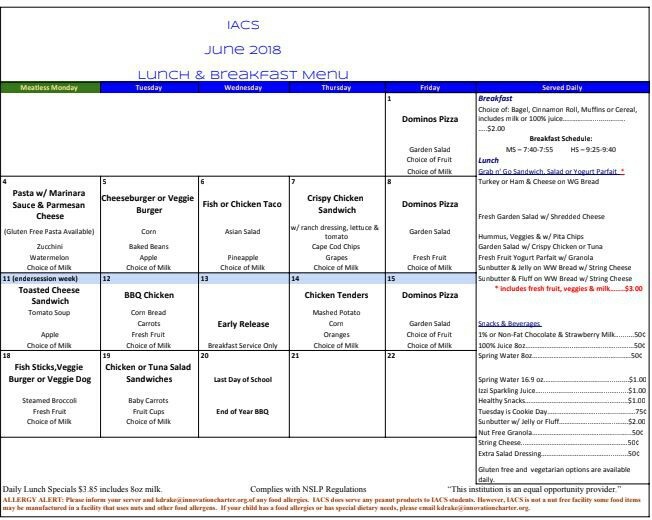 IACS is looking for a part-time cafeteria worker to assist in the preparation and serving of meals to its students and staff. This is a perfect opportunity for a IACS parent who is looking to work “parent hours” and enjoys working in a fast paced environment. Primary responsibilities include; food preparation, cashier, and dishwashing. Hours are: Tuesday,Thursday & Friday – 10:00 am-2:00 pm. Hourly Rate: $12/hr Contact: Karen Drake kdrake@innovationcharter.org or (978) 649-0432 x2008 if you are interested in the opportunity. 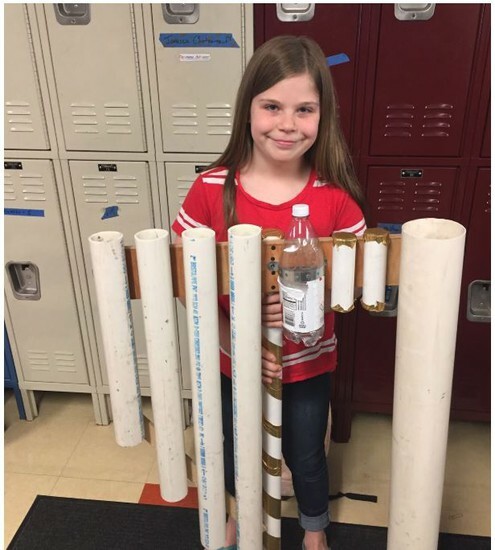 Fifth grade music students ended the year by building their own instruments. There were some cool-looking and sounding instruments! Well done! a water bottle, sunscreen, and bug spray. Please let Crystal McKiel, (cmckiel@innovationcharter.org ) know which orientation you will be attending so that we can plan accordingly. 8th grade Families: Click here for more information about the Moving Up Ceremony on Tuesday, June 19th. Remember that given space constraints in the auditorium, each 8th grader is allotted two guests. Return any borrowed school items by Wednesday. This includes library books, Chromebooks, e-readers and any athletics uniforms. Fun! If you are interested in leading a discussion group in the fall, check in with Ms. Hinkle. A limited number of copies will be available at the BBQ on the last day of school for $10 Stay tuned for other great suggestions for what to read/listen to/watch over the summer. Student Work Permits. All teenagers under 18 years of age must complete a work permit application and obtain a permit before starting a new job. 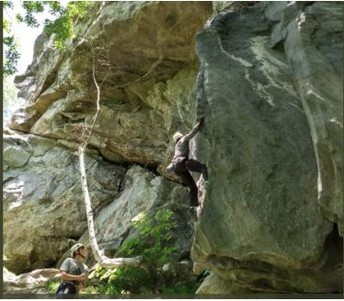 Complete information about youth employment as well as a pdf of the permit application can be found here on mass.gov. Full instructions for students/families can be found here. 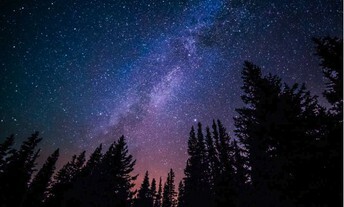 Do you like stargazing, astronomy and snacks? IACS is hosting its first official Star Party on June 18th! Consider it a date night, a time to hang out with your friends and/or a time to learn more about what’s in our sky! During the Star Party we will be on the track looking through several telescopes that are able to see Jupiter and its four satellites, the moon, Venus, and other deep sky objects! If you have any questions or are interested in contributing snacks, telescopes or other fun things to do, contact christina.mennella@innovationcharter.org or kiana.cabreragonzalez@innovationcharter.org for more information. Join us for 3 weeks of Performing Arts Camp that are open to the Community of and outside IACS! Camps are open to any students finishing grades 4 through 12.Camp begins at 8:30am and finishes at 3:30pm daily. July 9-13: GLEE CAMP where we will learn songs, dances and scenes from PHANTOM OF THE OPERA! Free, public performance of the students’ work on Friday, July 13 at 5pm! July 16-20: HAMILPROV WEEK where students will spend 1/2 the day learning about the Broadway sensation Hamilton, and 1/2 the day working on Improvisational games, activities and skills. Free, public performance of the students’ work on Friday, July 20 at 5pm! July 23-27: DRAMA CAMP Where we will learn the play THE GOOD DOCTOR which we will perform at a theater, right off Broadway on Tuesday, July 31! This performance will be open to actors of all ages at camp. If there are adults who can’t make those rehearsal times and would like to take part in the show as well, we can be flexible with your schedule so that we can have you with us as actors! Wednesday is coming and we need your help! Help us send the kids out to summer in style with another memorable event! Volunteer slots and food donations are still open: Click here to help. WE CAN’T DO IT WITHOUT YOU. THANK YOU TO ALL who’ve stepped it up this year and gotten involved with IACA and our many events. We hope you found your participation enriching and memorable! Volunteers truly are the lifeblood of our organization. PLAN NOW TO HELP: August Ice Cream Socials are great events to get your feet wet in the volunteer pool. Email IACA President, Jo Anne Frazier, at iaca@innovationcharter.org. We need your help to make this a great 2018- 2019 kickoff! The June Issue of Student Health 101 as well as the accompanying parent issue, Student Advocate are now available. Check out the article and learn how to stay motivated this late in the school year, as well as 4 Ways to Start to Build a Positive Body Image. Don’t forget to fill out the SH101 survey after reading these articles, you will be automatically entered for a chance to win $100!